Dana Harel was born in 1970 and raised in Tel Aviv, Israel. She received a Bachelor of Architecture degree from the California College of the Arts in San Francisco, and for the past seven years she has been working as a visual artist in San Francisco. Harel’s drawings evolve organically, fusing themes of man and environment. Her understanding of form through architecture leads to transformative depictions of human and animal, offering us an idea and not solution to our own internal struggle. 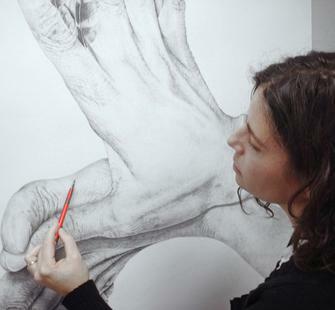 Each drawing combines thousands of refined strokes of graphite on large scale paper. Harel’s shows locally and nationally, and her work is held in various private collections. Her recent solo exhibitions have included those held at the Laguna Art Museum in Laguna Beach, California in 2014; Palo Alto Art Center in Palo Alto, California in 2014; Gallery Wendi Norris in San Francisco, California in 2012; and the Herzliya Museum of Contemporary Art in Herzliya, Israel in 2010. Harel’s work has also been included in numerous group exhibitions, including shows at the Bedford Gallery in Walnut Creek, California in 2014; the Headlands Center for the Arts in Sausalito, California in 2011; San Jose Contemporary Art Institute in San Jose, California in 2011; and the Napa Valley Museum in Napa, California in 2010. In 2009 she was awarded the Irvine Fellowship at Montalvo’s Lucas Artists Residency Program. During the residency, she was the stage designer for the opera “Conference of the Birds Unfeathered” which debuted at the Mondavi Center for the Arts at UC Davis and at Montalvo.